I LOVE this chair designed by Finish architect and designer Alvar Aalto in 1929, which was shared with us in a brief introduction to ‘the history of style’ during my first lecture at KLC. Aalto is best known for his contributions to modern architecture and building design at the beginning of the 20th century when he expanded into interior design and furnishings in a collaborative effort with his wife, Aino Marsio-Aalto, creating pieces that were organic and always had a deep sense of humanity.The armchair seat and back are made of curved plywood and the arms and base are laminate and curved beech. It is often the smallest. 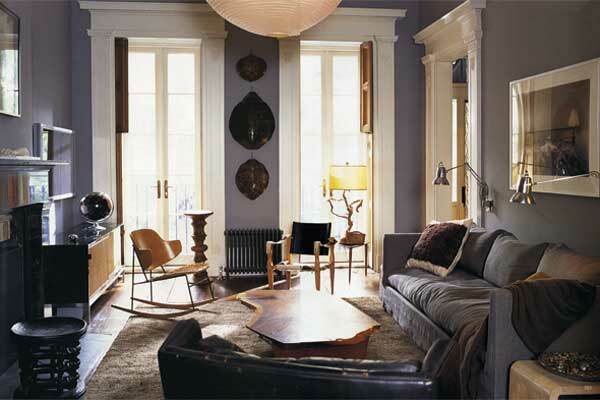 simplest, cheapest things that add the ‘wow factor’ to a room, and it’s just so in this beautiful space. 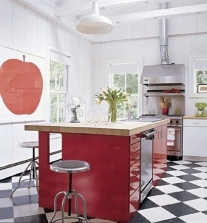 The red firework-like explosion of just a few stems of tulips draw the eye and really make this space what it is, adding a tiny burst of excitement in an otherwise quite simple, relaxing space. Since moving to London I have always lived in house shares or tiny flats, so there has rarely been a day go by that I didn’t enter a room draped in wet washing. Wet washing, half-dry washing, dry washing, ironed sheets, un-ironed sheets; the washing cycle of life means that there is always washing that either needs to be done, or has just been done, somewhere in the home. For me, with either a plethora of flatmates and/or very little hanging space, this has resulted in living literally with my washing for the last 8 years! Whether draped on banisters, hung over tops of doors, hanging over the end of the bed or lying flat on the kitchen table (‘hand wash only. 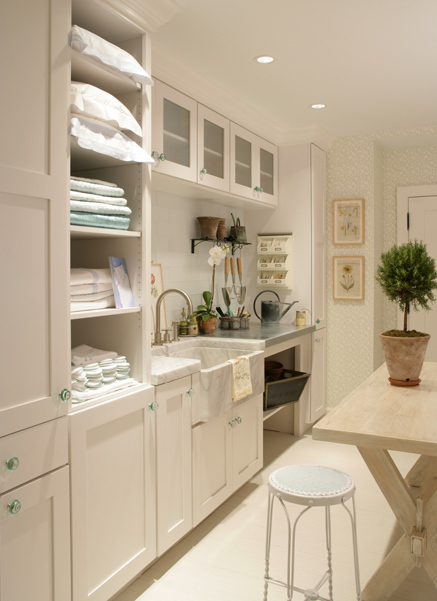 Dry flat…’) it would be absolute heaven for me to have a laundry room. 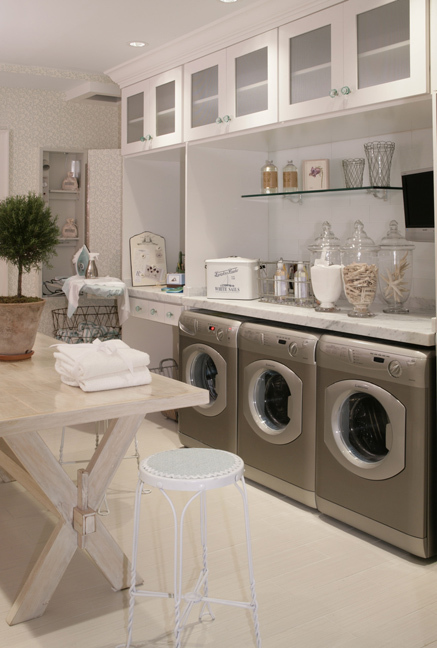 If someone asked you to name your favourite room in the house, or the room that made you feel most spoilt/ content, I am sure that the laundry would be at the bottom of many peoples lists but, for me, the thought of a little laundry room is extravagantly decadent. 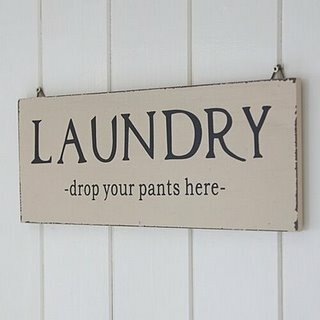 On that note I have found some beautiful laundries that I will covet until I find space big enough to finally squeeze one in. Welcome to ‘Spotted,’ a weekly post that shares great stuff I have seen, heard, experienced, found, discovered, sought out or just loved each week. 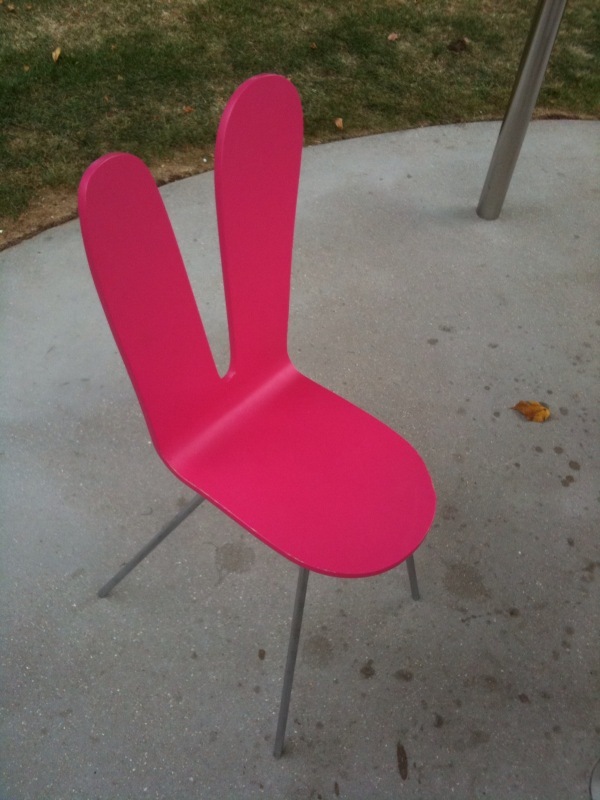 My first post is this brilliant, somewhat ironic, take on the classic ‘bunny’ chair. Spotted in the Serpentine Gallery’s outdoor cafe after a trip to the Jeff Koons exhibition ( brilliant by the way) I fell in love instantly. Decadantly girly with its fluro-pink bunny ears this one would definitely be confined to the study by my fiance. For my interview at KLC School of Design I was set the task of creating a mood board for the re-design of a Fashion PR’s studio apartment. The challenge got me thinking about the inevitable similarities between fashion design and interior design. 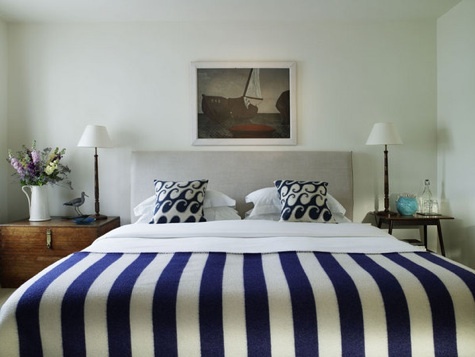 Constantly changing seasons, the need for flexibility, personalisation of trends, low/ high maintenance looks and ever-adored classics, are just a few of the things that make both design worlds ‘tick’. The five fashion images below inspired me to trawl my files in search of spaces that reflect the gorgeousness of each wonderfully individual, fashion-forward look. 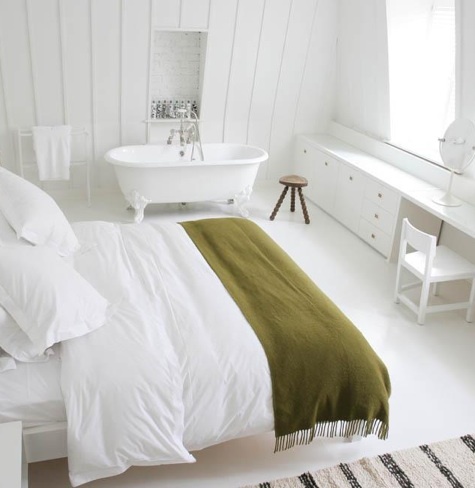 From the splash of colour on Sarah Jessica Parker’s kitchen unit inspired by the luscious redhead, to the natty ‘nauti-ness’ of ‘Gossip Girl’ Blair’s ensemble, which inspired the seaside bedroom at the Tresanton Hotel in Cornwall, each fashion shot enabled me to channel a different feel, and find a collection of five diverse, fashion-inspired interiors that I hope you’ll enjoy. The destination was the light bar at the St Martin’s Lane Hotel, the spot of one of our first dates, where we most certainly fell in love over a good few glasses of toffee champagne, and I thought that this would make the perfect topic for my first blog. Interior Desigher Albert Hadley once said “Design is defined by light and shade.” The light bar, as well as being a beautiful place to fall in love and drink toffee champagne, would be nothing if it weren’t adorned by the splashes of light that make it as sparkly as the ring I was given later that night, whilst the carefully created pockets of shade are perfect for intimate encounters. The stools are here just because I love them, they remind me of a herd of baby turantulas.